We've never been to Venice, so after a couple of nights in Rome getting our bearings(transatlantic flights don't get much easier with the years) we took the train to Venice. How would we get around? Could we find our way in the dark? Would it live up to its reputation as the most beautifully improbable city in the Western world? The ride from Rome to Venice is about 4 hours and frankly is fairly tedious after the first couple of hours. Much of the trip is under the base of the hills and mountains that make up the spine of Italy. So, when the train finally leaves the last mainland station behind and pulls across the narrow, 2-mile causeway, with the sparkling waters of the Venetian lagoon on both sides, into the Stazione Santa Lucia (no, not the famous Italian song - which is a traditional Neapolitan song adapted as a gondolier's song in the mid 1800's, rather Saint Lucia, the virgin martyr) well, the stage is set. Having first developed opera, with its highly defined sense of the dramatic, in the late 16th century, the Italians (and particularly, the Venetians) have had a long time to perfect the art of stagecraft. You can't see Venice as you approach (there are no buildings more than 4 or 5 stories high, except for the omnipresent bell towers common to all Italian cities large or small) and even when the train enters the station and you disembark, Venezia still remains behind the curtain. When you step off the train you can smell the sea. To be able to smell anything in any train station anywhere other than foul human odors and the curdling scent of locomotive brake dust is no mean accomplishment and bodes well. Walk through the station into the sunlight. The curtain is drawn back and ecco la - there it is! Venice. Venezia. City of glass and carnival masks. La Serenissima - The Most Serene. Smack on the Grand Canal, lined with 17th Century palazzi in their fast-fading grandeur; the Canal abuzz with vaporetti (the public water buses) private water-taxis - heavily lacquered and polished teak - and the occasional grabage skow (yes, even fairylands have garbage and everything in Venice moves by water - or it walks). It is a breathtaking first impression. My initial thought was, "I've never been anywhere before this.". Quite simply it was astonishing. My eyes popped out. So, without too much trouble, you manhandle your luggage onto one of the water buses with the rest of the tourists and away you go - down the Grand Canal and off to your hotel. The ride is just a jaw-dropping testimony to the beauty of the improbable made real. Venice, built on tens of millions of wooden pilings driven into the mud banks and marshes of the Adriatic, makes no sense at all. Nevertheless - ecco la'. Our hostess was a young, native Venetian, who had converted a few rooms in her family's ancestral home into a B & B. She still lives in the house with her husband and three children. 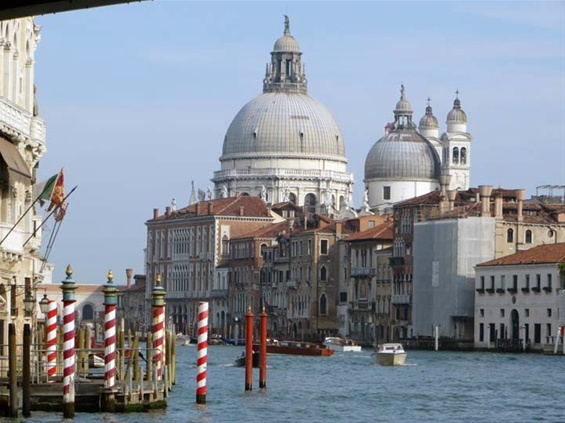 Venice is devilishly expensive and essentiall populated by innkeepers, restaurant owners and ultra-wealthy socialites. Her family was well connected (her father was best friends with Giuseppe Cipriani - the hotelier and founder of Harry's Bar - the home of the bellini, the fabulous prosecco and peach juice concoction). The B & B is right next to La Fenice (The Phoenix) Venice's opera house - appropriately named, given the number of times it has burnt down and been rebuilt. It is, perhaps (or "certainly" if you ask any Venetian) Europe's most beautiful. She could never imagine living anywhere else. Since the time her children were 5 or 6 years old they've been allowed to go wherever they wish in the city. No one is afraid they'll be abducted or fall into a canal. They always find their way home. No kid wears a bicycle helmet. Hardly any kids ride bikes. Venice is not really built for any kind of wheeled vehicles. No one locks their doors. Her friends who cannot afford to raise their families in Venice or who judge Venice too inconvenient have moved to Mestre - a thick spot along the rail lines and the jumping off point from the mainland to the islands of the lagoon and Venice itself. She describes it as a sad place, filled with cars and locked doors and mothers who are forced to spend their days shepherding their children from place to place. She does not envy them. She pities them. She also does not envy her guests. Mostly, I suspect, she tolerates them. Some, however, she pities, I suspect. 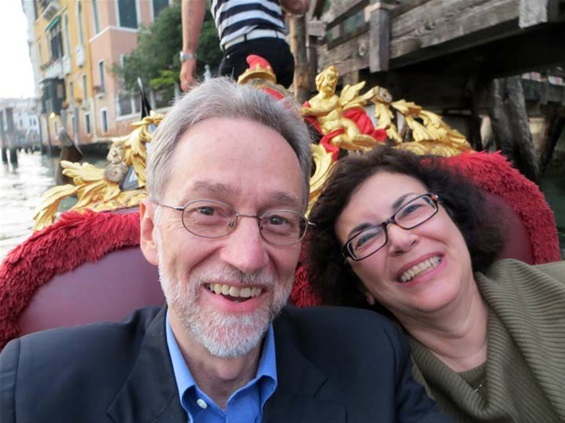 Falling into that rung of hell could be the couple from Virginia who we saw at breakfast one morning. It was their first time in Venice and the wife expressed surprise that the main shopping areas of the city were largely populated with high-end, high-fashion stores. "When did they arrive?" she asked our hostess. "Perhaps I'm being naive, but I was expecting something more ... more ... intimate." Well, I'm sure that the grandchildren of Signore Ferragamo believe the experience provided in their nonno's salon is quite "intimate" indeed. Beyond that, most of the high-end stores which were the subject of inquiry didn't really "arrive" from anywhere. It could more reasonably be said that Ferragamo, Gucci, Zegna, Bruno Magli, Versace, Fendi and all the other Italian designers had, well, been here all along. Historically, the days of "intimate" shopping probably ended in 1204 when the Crusaders returned with the plunder of the Orient. Our hostess, very diplomatically, explained that the high-fashion crowd moved in perhaps 10 or 15 years ago but that there were lots of "more normal" stores in the outer reaches of Venice's neighborhoods and that it was largely the Chinese and Brazilians who frequented the tonier establishments looking for $1500 shoes and multi-thousand dollar gowns. Venice, whatever one's economic status, is filled with wonderment. Granted, much of it is pricey but the bulk of it is there for the observing. We went on a gondola ride. Yes, it qualified as "pricey". But, as once in a lifetime experiences go, it was a bargain. Gondolas have plied the canals of Venice since the 12th century. You can still float past the boatyard that has stood in the same spot for nearly a thousand years making the beautiful boats. 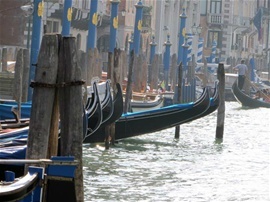 In the 1500's there were over 10,000 gondolas in Venice. Today, there are perhaps 350 or so. They are all black (since 1562 when the city fathers decreed that the ostentatious competitive decoration should cease). The right side of the boat is lower than the left since the gondoliere always stands on the left side and in doing so, balances the 11-meter craft. They are all the same size and made of 7 kinds of wood. Not all gondoliere sing. The singers and ther accordion accompaniment usually travel around with 3 or 4 gondolas in order not to bankrupt ("bankruptcy" - another Italian invention, though of Florence, not Venice) the paying customers. The gondoliere inherit their positions from their fathers or uncles and the open spots are highly sought and the subject of cosiderable political intrigue. The ride, away from the Grand Canal - which with all the traffic is rather choppy most of the time - was like glass. There's no noise. Virtually no people. Just the old nonna at her window who wishes us buona sera as we glide by under the Venetian moon. And the floods? That nasty and disruptive alta aqua - the seasonal tides that fill Piazza San Marco (and much of the rest of the city) during the winter, what about those? We were spared. As for the future, Project Moses, at the cost of many billions of dollars, is still ongoing. Designed essentially to control the tides in the outer lagoon it is, at the very best, a questionable success. The chief benefactors being those closest to the sea of money involved in the project. As to Venice and its citizens, the ostensible beneficiaries, well, not so much. For them, it has simply caused the water to rise in different places than before. Turn back the sea? No. Not really. Yes, Venice is doomed. It is fighting two most elemental and inexorable forces - water and gravity. Eventually, the ocean will rise, Venice will sink and one of mankind's greatest achievements will disappear. Never to return. But until then, we - you and me, Venice and the Venetians - are still very much alive. Eating, sleeping, singing, going about our daily tasks. Wearing our masks as we wander down dark streets lit only by moonlight and an occasional spark of magic.